I just read a very interesting article about a recent study by Dr. Julia Lippman from the University of Michigan. The study demonstrates that watching people engaging in stalking behaviour in romantic comedies causes viewers to see this type of behaviour as acceptable. The outcome of the study wasn't surprising to me, as I've been thinking and writing about the damaging effects of certain media portrayals for the past several years. What I've observed is that the movies and TV often misrepresent how healthy relationships ought to unfold. There are six behaviours I've observed on TV and in the movies that ought to cause a person in real life to be concerned, and perhaps even run away. In the movies, however, these creepy, scary or abusive behaviours end up being viewed as indications of romantic ardour or the charming quirks of an otherwise loving partner, and the couple invariably gets together, living happily ever after. Romantic comedies are normalizing abusive and unacceptable behaviours and fostering a culture in which people are supposed to accept the unacceptable from a potential, actual or past romantic partner. This study by Dr. Lippman confirms that romantic comedies are giving us a distorted and dangerous idea of how we should carry on our relationships. Here are the six completely inappropriate behaviours that are portrayed in the media as perfectly acceptable, even romantic. 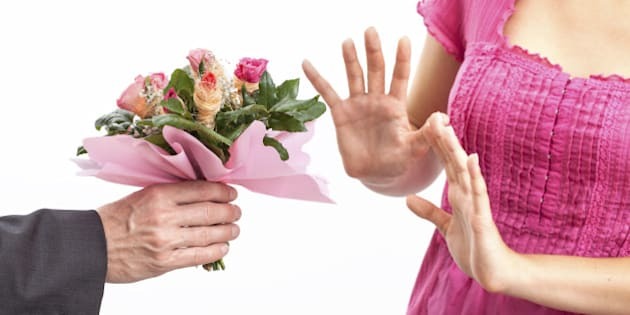 In the movies or on TV, when a relative stranger finds out where the other person lives or works, and then drops off presents or shows up unexpectedly, it's presented as a romantic gesture. In real life, this is predatory behaviour -- the hunter pursuing their prey -- and a sign that the relationship may become abusive. When we observe people violating someone's boundaries on the big or small screen, we're told at the same time that in fact these actions are romantic. One good example of this is not taking "no" for an answer. In the movies or on TV, ignoring a "no" is seen as a sign of romantic devotion. In real life, when we tell someone to leave us alone and they don't respect our wishes, they're violating our boundaries and letting us know that they'll likely never take "no" for an answer from us. In the movies and on TV, the end of a relationship isn't seen as a finite ending, but rather an opportunity to convince the other person that they've made a mistake and that they should get back together with the other person. In real life, stalking an ex is abusive, disrespectful, threatening and illegal. On-screen, the big come-on is a sign of a tremendous passion that will be the basis for an enduring love affair. In real life, one person's intensely sexual behaviour toward someone they don't really know is a sign that their priorities are skewed firmly toward the physical, and that a real relationship is exceedingly unlikely. On-screen, people engage in behaviour that's rude, mean, nasty, critical or controlling, and the person on the receiving end almost always forgives and forgets. The hurtful person then suddenly changes their ways and becomes kind, thoughtful and respectful, and the relationship proceeds to be loving and supportive. In real life, someone who behaves this badly during courtship will more than likely be even more abusive once the relationship is established. On the big and small screen, when someone stops calling, emailing or texting and disappears for a while, this is seen as forgiveable. The couple always reconnects, the person who disappeared is forgiven and the relationship ensues without consequence. In real life, it's always a bad sign when someone goes radio silent. Are they in fact married? Are they ambivalent about intimacy? Are they disrespectful? None of these are conducive to a positive relationship. The bottom line is, don't believe what you see portrayed on the big or small screen. When people you are, might be or have been romantic with are behaving badly toward you, take it seriously, take care of yourself, and perhaps you'll even need to walk away. Sign up here for my free monthly wellness newsletter. March is all about permissiveness and over-entitlement at home, school and work.